This is a custom work made for The Desert Beckons, a local rock and jewelry shop. It was made through hand-painting gold and silver card stock with a metallic rainbow splatter pattern. I then cut the painted card stock into 270 four inch squares, which were then folded using the traditional Sonobe technique of mod ular origami. 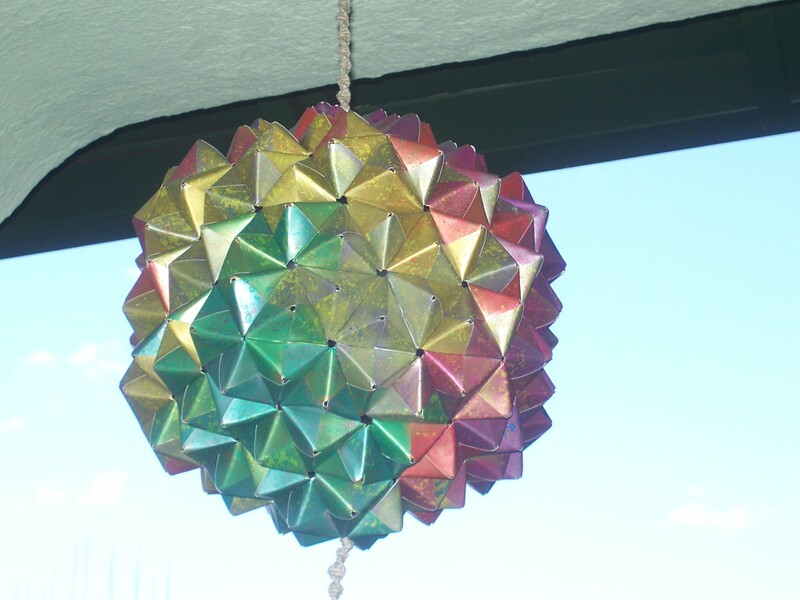 This large multi-faceted orb can be technically described as a stellated truncated icosahedron. If you look closely you’ll notice that the peaks form pentagons, which are surrounded on all sides by hexagons. 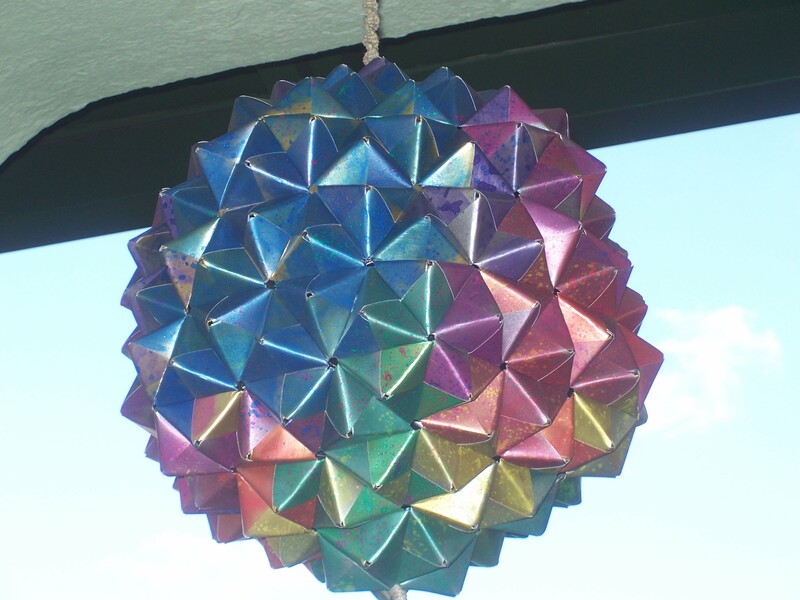 A similar geometry is used in both a common soccer ball as well as Disney’s famous Epcot Center. The geometry and symetry of this shape is absolutely captivating; you can get lost in the patterns of triangles, hexagons, and other shapes which emerge. 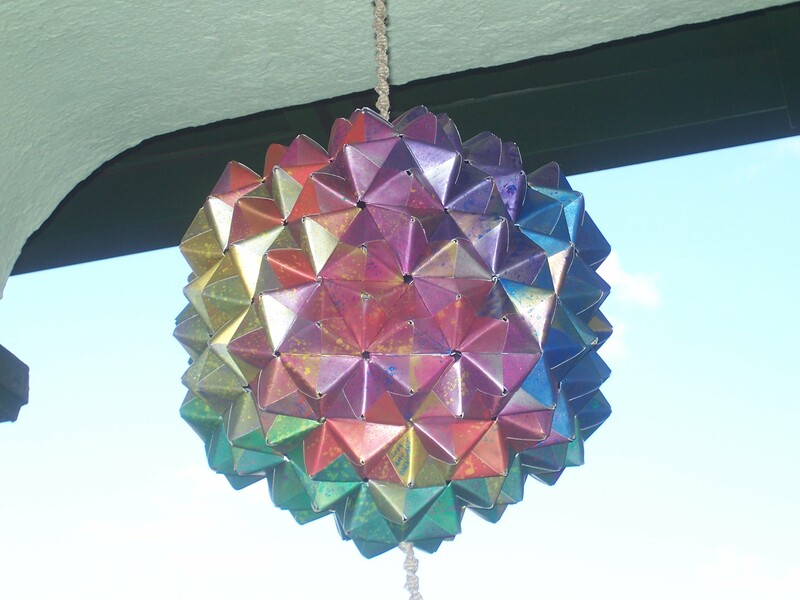 When finished, this sphere was about 15 inches in diameter. When designing the concept for this piece of art, we discussed several color schemes, and finally settled on this magnificent iridescence. The semi-random splattered rainbow closely resembles chips of natural titanium, which seem to glow and shimmer ever under dim light. This art was requested to be functional, and lives on display as the shop’s fan pull. 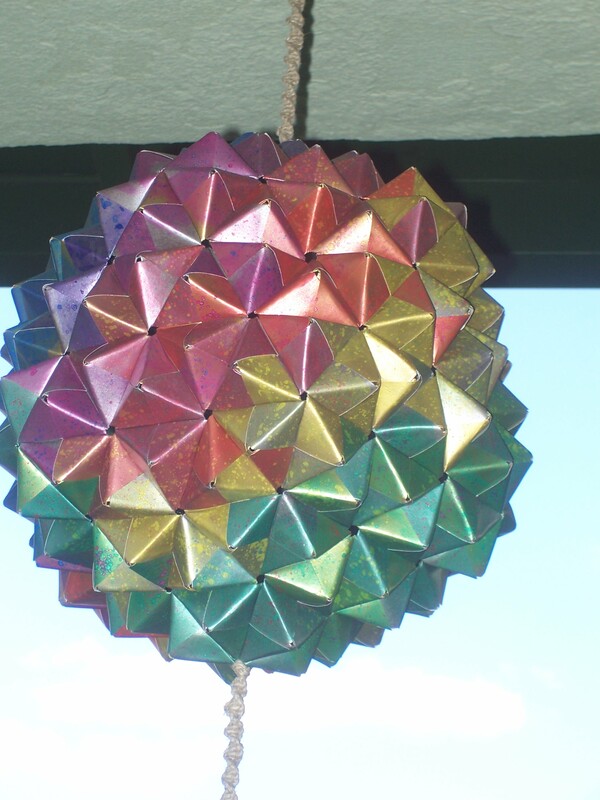 As such, I hung the buckyball from a 8-strand spiral of hand braided hemp which hung through the sphere for a total length of about 3 feet. At the bottom of the spiral rope are loops on which beads or signs can be strung (not pictured). This gallery site is currently under serious construction. Please check back soon for more of the Amigami Showcase!